Our Teardrop Flag Kit Carrying Case is made of polyester with canvas texture and measures 62" in length and 10" in height. This zippered carrying case is recommended for easy storage and transportation of our Teardrop Flag Kits including other accessories. The zippered carrying case has interior velco pockets to securely hold your teardrop 3-piece pole, spiral ground mount, flag stand, empty water weights, and many teardrop flags. In addition, an ID pocket window is located on the exterior of the case for inserting an ID card, if desired. 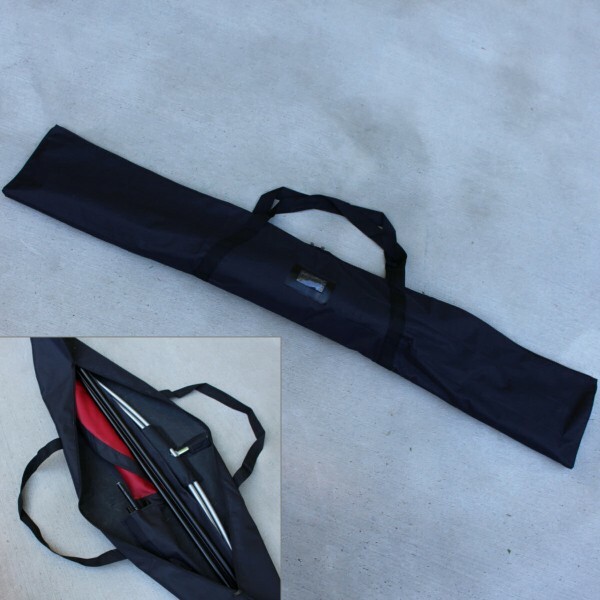 This Teardrop Flag Kit Carrying Case is a recommended accessory for our 9' Teardrop Flag Kits.